Bildungsroman, by definition, is a novel that deals with a person’s formative years. Under this category you have some of the obvious suspects. The self-aware novels that look at characters growing up and learning who they with a bit of nostalgia and some healthy distance. I always think of a bildungsroman as grand or even lofty. Growing pains, on the other hand, is more of a moving target because it’s hard to stop and say, “Hey, this is a formative moment,” while it’s happening. It is hard to know, while you are busy getting older and learning things in sometimes painful ways, that eventually you do come out on the other side a little stronger and (hopefully) a little smarter. These are the novels that aren’t always the prettiest, the characters don’t always make the best choices, but they are honest and they are raw. In any coming of age book, I image the main character is facing a line in the sand. At the beginning of the book they are on one side and by the end they have crossed that line into new territory. Sometimes that happens quite suddenly with one defining moment. Sometimes it’s a subtler thing that happens gradually over the course of the book. These are characters who are coming into their own whether that means figuring out who they are (and want to be) or just learning to embrace that person. The Absolutely True Diary or a Part-Time Indian by Sherman Alexie: This book is equal parts hysterical and heartbreaking as Arnold struggles with his decision to leave the reservation to attend an all-white high school in the neighboring (all-white) town. Nothing in Arnold’s life is easy as he adjusts to a new school and looks toward his future. But it’s all brilliant to read. The Best Night of Your (Pathetic) Life by Tara Altebrando: This book is the quintessential end-of-high-school read as Mary and her friends all wonder what the future holds during one crazy night competing in an end-of-the-year scavenger hunt. Even though the entire novel takes place in one night, this story still asks (and often answers) the same questions found in coming of age stories. The Vanishing Season by Jody Lynn Anderson: Technically this book shouldn’t be on my list because it includes a ghost. But it’s so good that I had to bend the rules. Maggie’s life is turned upside down when her parents move and she crosses paths with a beautiful boy and a reckless girl. Just when Maggie thinks she understands what her new life is going to be like, everything changes with disastrous consequences. Love and Other Perishable Items by Laura Buzo: With not one but two clever narrators, this book left me gutted. Both Amelia and Chris are at very pivotal moments in their lives when their paths cross as the supermarket where they work. Chris, in particular, makes some really foolish but also very hard and responsible choices when he is forced to decide exactly who he wants to be moving forward. A Little Wanting Song by Cath Crowley: As Charlie and Rose tell the story of their summer the narratives overlap and intertwine coming together to create a story about friendship and longing and ultimately about optimism as they both realize the world is theirs for the taking. Take a Bow by Elizabeth Eulberg: Set at a specialized high school for the performing arts in New York City, this novel follows Emme as she moves into the spotlight. This is an empowering, charming story about a girl coming into her own and (very literally) finding her voice. The Year My Sister Got Lucky by Aimee Friedman: While her sister blossoms in their new bucolic town, Katie struggles to understand what being a teenaged girl really means. This novel is also a thoughtful commentary on how much can change even when it feels like you are standing still. Life by Committee by Corey Ann Haydu: Of any of these books, this is the one I wish I had been able to read as a teen. Tabitha is a great heroine who knows who she is and who she wants to be. But she also has a difficult time being that person in real life and struggles with weighing her actions against their potential consequences both for herself and for others. Stupid Fast by Geoff Herbach: In the span of one surreal summer Felton has a chance to remake himself as he goes from joke to jock. Felton never sets out to change himself but in the wake of a sudden growth spurt and a surprising aptitude for football, Felton is faced with the opportunity to make himself into something entirely new. And We Stay by Jenny Hubbard: Here is a subtle, quick novel that will stay with you. A lot of Emily’s development here is shown through her poetry during one turbulent semester at boarding school. The Key to the Golden Firebird by Maureen Johnson: May and her sisters are left reeling after their father’s sudden death. Without him, their family begins to fall apart. While much of this story focuses on their grief, this book also shows May growing up and coming to terms with the new dynamics of her family in the wake of their loss. Stealing Henry by Carolyn MacCullough: When Savannah decides she has to leave home and her abusive step-father, she knows she has to take her little brother along. Savannah and Henry’s journey to their grandmother’s house alternate with chapters from Savannah’s mother when she was a teenager. This story, told in contrasts, explores how one choice–good or bad–can alter the course of a life forever. Looking for Alibrandi by Melina Marchetta: Everything Josie thought she knew about her family is thrown into question when her long-absent father reappears and she finds herself caught between the attentions of two very different boys. This slice-of-life novel, set at the end of high school, explores themes of identity and change beautifully. After the Kiss by Terra McVoy: In another life, Camille and Becca might have been friends. But in this one both girls are left confused and hurt when Becca’s boyfriend kisses Camille at a party. In the aftermath both girls are forced to re-evaluate their ideas about their lives and themselves. The Miles Between by Mary E. Pearson: This book pushes the limits of contemporary as Pearson brings a real sense of wonder to this story that is otherwise grounded in the details of a girl trying to find one perfect day (and maybe herself along the way). This Song Will Save Your Life by Leila Sales: Although she is troubled, Elise remains extremely self-aware and always questions outcomes throughout the story in a way that is both effective and refreshing. While there are elements of romance and friendship (and bullying) I’d still argue this is a coming of age book as so much of the plot focuses on Elise deciding who she wants to be. A Map of the Known World by Lisa Ann Sandell: In addition to dealing with her brother’s death, Cora has to deal with the more mundane matter of starting high school. As her best friend throws herself into their new environment, Cora finds herself at the sidelines trying to figure out what it means to be growing up, especially when she knows her brother never can. The Beginning of Everything by Robyn Schneider: Schneider packs in an array of literary and pop culture references with a smattering of foreign vocabulary thrown in to taste. Ezra’s story is both familiar and original as Schneider turns the very idea of a Manic Pixie Dream Girl completely upside down. Absolutely Maybe by Lisa Yee: When Maybelline Mary Katherine Mary Ann Chestnut (Maybe for short) decides to travel across the country to find her father, she doesn’t expect to find a screen idol, a Rolls-Royce or a taco truck. But those things and more help Maybe make sense of her mixed up family and realize home isn’t always a place. Memoirs of a Teenage Amnesiac by Gabrielle Zevin: With Naomi’s amnesia at the center of the plot, this book asks interesting questions on the ties that hold a family together and what happens when the context that makes two people friends (or more) is suddenly taken away. Heist Society / Uncommon Criminals / Perfect Scoundrels by Ally Carter: These books about a teenaged cat burglar might push the limits of the contemporary genre but I just had to include them. Kat’s growth across the three books as she learns to embrace her unique skill set and her family (blood relatives and otherwise) is everything that is good in coming of age books. The Boyfriend List / The Boy Book / The Treasure Map of Boys / Real Live Boyfriends by E. Lockhart: Ruby Oliver’s struggles with friends, panic attacks and, of course, boys are immediately approachable to any reader. Watching Ruby grow up and learn from past mistakes over the course of her high school career is also an immensely satisfying read. Alice, I Think / Miss Smithers / Alice MacLeod, Realist at Last by Susan Juby: This quirky trilogy follows Alice MacLeod from her early days returning to public school after years of homeschooling through an unfortunate unfortunate beauty pageant and other misadventures. Although these books are madcap in the extreme, Alice is still so authentic and so very wonderful. Her progression throughout the series is top notch. 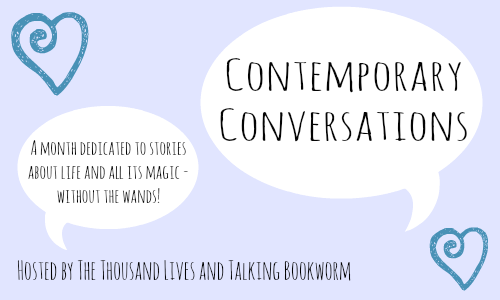 Thank you again to Kayla and Veronica for inviting me to write a guest post about coming of age stories for their Contemporary Conversations series! I loved Love & Other Perishable Items! Is it the worst time to admit that I haven’t read anything from this list? Yikes! But a lot are on my TBR but there are a lot which I’m not familiar too. Thank you for the recs because they’re not the usual recommendations, Emma! Looking forward to reading these soon(ish)! I hope you love whichever ones you get to read! lol the word bildungsroman has me getting flashbacks to high school English. Oh man, those were the days. Woah that’s quite the list of recommendations! I actually haven’t heard of more than half of them, but I definitely will be checking some of them out. Memoirs of a Teenage Amnesiac especially sounds so interesting! Along with Love and Other Perishable Items that might be my favorite from this list!